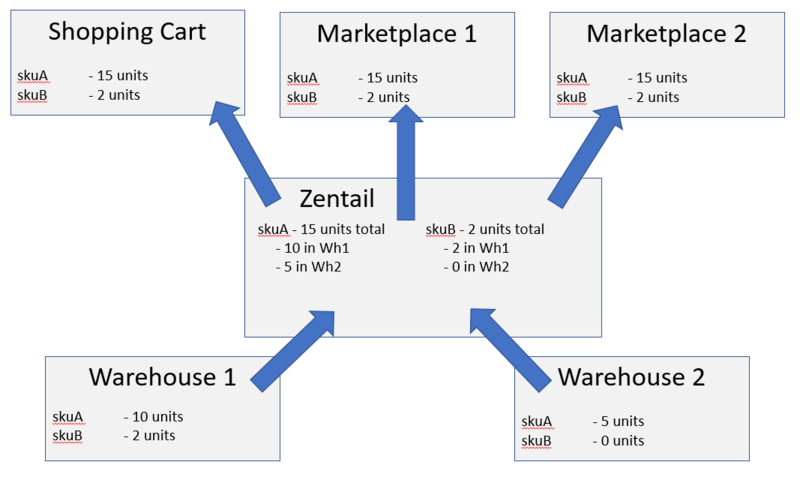 Now that you're using Zentail to potentially connect your shopping cart, the marketplaces you sell on, and various fulfillment and inventory integrations, it is very important to standardize your SKUs across your integrations / marketplaces. Think of your SKU as a unique identifier, a key, to connect your products across different systems. If you have inconsistent SKU values across your various systems, it can cause gaps in this connection. For some, this is an intensive exercise to clean up your catalog. However, we highly recommend putting in the time and effort to standardize your SKUs as soon as possible as you'll realize the benefits immediately. Zentail has a few tools to help streamline this process. We'll go into those in more detail shortly. What are the benefits of having standardized SKUs? You'll be able to manage inventory, orders, pricing, and analytics under one SKU instead of managing this across different SKUs in different places. Using one SKU to maintain inventory across different warehouses (your FBA warehouse, your 3PL, and your local warehouse) allows you to take advantage of Zentail's order routing. We can automatically route an order from a specific channel to the correct warehouse based on rules you set up in Zentail. What is the problem with having different SKU values? Let's say you have a SKU named skuA_shopify which is the same product as skuA_eBay which is the same as skuA_jet. You would need to have each SKU in Zentail (skuA_shopify, skuA_eBay, and skuA_jet) in order to properly send inventory, product data, and route orders to the correct warehouse. This likely involves creating alias relationships. If you have an outside inventory management software or 3PL, you would need to have all three SKUs in those locations as well. What SKUs should I use as my standard SKU? We have a few options for you. In general, if you are using Fulfillment by Amazon (FBA), then we recommend adopting the FBA SKUs as your standard SKU values. This is because it can be difficult to change the value of an FBA SKU once it is already established with inventory. It generally takes time for FBA to move your inventory from one SKU to another and you would likely experience downtime during this transition. Therefore, it may be easiest to simply adopt this FBA SKU value everywhere else. If you are already live on multiple channels and are using the MF version of the SKU as your standard SKU value then you can choose to Merge your SKUs on Zentail and have the MF version survive as the standard SKU. Amazon requires different SKUs for FBA and FBM, how does this work with standardized SKUs? Zentail will still connect to existing FBM SKUs or create new FBM SKUs on Amazon only. If you already have FBM and FBA SKUs for the same ASIN on Amazon, you will want to merge your SKUs. If you create FBA SKUs in Zentail and then add FBM inventory to that SKU, we will automatically create the FBM SKU on your Amazon Seller Central (they will have a "+MF+" at the end of their SKU Value). If you've selected to use the FBA as the standardized SKU value, your SKUs in SkuVault & Fishbowl should match the FBA SKU value. Your SKUs on Jet, Walmart, eBay, etc... should match the FBA SKU value. Even if you are only using merchant fulfilled inventory for those channels, all inventory across all warehouses will be held within one SKU. You can set rules on Zentail to enable / disable warehouses on a per channel basis. Amazon: Merge FBA and MF SKUs. Merging SKUs refers to combining your FBA and FBM SKUs in Zentail (Merging SKUs). Walmart: Check off "Set the SKU Override Flag on Products sent to WM" on your Walmart Integrations Page How to Set SKU Override for Walmart. New SKU values are linked to previous listings based on the Product Identifier (UPC, EAN, GTIN etc.). Jet: Archive Old SKUs on Jet; New SKUs will replace old listings on Jet How to Archive old Jet SKUs. eBay: Change Custom Label field on eBay to match SKUs in Zentail. BigCommerce/Shopify/Magento: Change SKUs on each channel to match SKUs in Zentail.